YOUR MAMAS NOTES: We first heard word from Yolanda Yakketyak a few days ago and then we heard it again this morning from Lucy Spillerguts who both snitched that body-licious actor Chris Evans dropped a bit more than $3.5 million on a walled and gated superhero-worthy lair high above Laurel Canyon in Los Angeles, CA. Young Mister Evans, now in his early thirties, has primarily made a Showbiz name for himself portraying super-empowered superheros in a trio of money-minting blockbuster film franchises adapted from comic book stories: the Fantastic Four, The Avengers and Captain America. According to the fine folk at Box Office Mojo just those three, still rolling franchises have hauled in more than a billion bucks in gross theater receipts and that's not counting all the swag and crap they market and sell the hell out of with these big tent fantasy-action superhero flicks. Here's hoping Mister Evans teams of managers, agents and business managers managed to snag a bit of the back end of those juggernauts. Mister Evans also had a small part the well regarded fantasy-comedy Scott Pilgrim vs. The World, a starring roll in the also well regarded Danny Boyle directed sci-fi thriller Sunshine and the romantic lead in the unmitigated box office flop The Loss of a Teardrop Diamond with skilled Tinseltown scion-ess Bryce Dallas Howard. For better and worse Mister Evens is probably as well known for his well-formed physique. Much to the drooling delight of lusty people of all persuasions he is frequently photographed shirtless with his thigh-thick biceps a-bulge, his abs a-ripple and his body hair meticulously manicured. Not unexpectedly the six foot tall side of man-beef has over his nearly 15 years in Tinseltown attracted and (allegedly) dated a slew of also well-formed and high profile females who include Kate Bosworth, Jessica Biel, Gisele Bündchen, Christina Ricci and Amy Smart. So the tabs and gossip glossies say, Mister Evens is currently romantically entangled with actress Minka Kelly (Friday Night Lights, Parenthood, the t.v. series Charlie's Angels) who herself has a bit of a thing for well-formed and high profile man-friends including but not limited to Derek Jeter, John Mayer and Donald Faison. Property records and other online resources reveal the seller purchased the property only last June (2012) for $1,901,000, gave it a once over with the renovation stick by the Stewart-Gulrajani Designs team and popped it back on the market in February (2013) with a $3.5 million price tag. 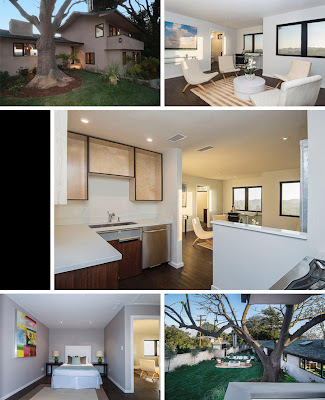 There appears to have been some competition for the freshly rehabbed residence because it quickly went into escrow and sold in early April for twenty grand over the asking price. A high wall with locked and secured entry gates zig-zags its way around and completely encloses the front yard that is both usually roomy and flat for a house located this high in the hills. The landscaping plan called for a long patch of grass cut by a uniformly repetitious row of large rectangular concrete pavers that lead to the front door. To one side the lawn is punctuated by a two-tiered square fountain set into a pill-shaped crushed granite pad. Your Mama suggests aggressively prickly bougainvillea be planted around the perimeter that's encouraged to balloon and drape in a riot of fuchsia over the top of the wall. Just a thought. Listing details Your Mama managed to squirrel out of the depths of the interweb shows the newly stucco-sided and fully contemporized ranch residence has three bedrooms and 4.5 bathrooms, a count that may or may not include the separate but attached one bedroom and one bathroom guest/staff apartment. A barely there entry vestibule spills immediately into the formal living room with dark brown wood floors, a pitched ceiling and a simple firebox set into a masonry wall flanked by two nearly floor to ceiling windows that frame sweeping canyon, mountain top and San Fernando Valley views. The adjacent dining room has a vaulted ceiling crossed by a muscular exposed truss with rugged steel hardware. The room is well equipped with a built-in wet bar/serving station and a wall of glass doors that expose the room to the same expansive views as the living room. The less formal living areas center around a spacious open-concept kitchen that's expensively equipped with a 60-inch commercial-style name-brand range surmounted by a massive 10-foot wide industrial stainless steel vent hood. There's also, according to listing details, a built-in microwave, a warming drawer (or two), a pair of dishwashers, a side-by-side fridge and freezer set up, and a built-in Euro-brand coffee maker. The dark wood custom cabinets are topped by a uniformly striated slabs of stone that listing details call out as "Italian Bianca Marble." Only the massive, bi-level center island/snack bar separates the kitchen from the somewhat slender family room that opens through a series of collapsing glass doors to backyard and swimming pool. Like the family room, wide expanses of glass doors fold back to expose the room to the sweeping view over the San Fernando Valley side of Laurel Canyon. A floating ipe wood deck extends the resident's private quarters to an only semi-private space clearly if distantly visible from most if now all other areas of the long, wedge-shaped backyard. Off to one side and beyond the concrete terracing along the back of the house and around the dark-bottom free-form pool and elevated circular spa, there's an elevated, tree-shaded viewing spot ringed by a meandering stone wall. Just below that a long poured concrete bench runs along the slope near a built in fire pit. Above the attached two-car garage and blessed with a separate, private exterior entrance is a handy-dandy guest house with a small but high-grade open-plan kitchen that's probably bigger and better equipped than the average person's kitchen, a living/dining room with expansive panoramic view, a separate bedroom with access to private balcony through a sliding glass door, and a crisply modern full bathroom. 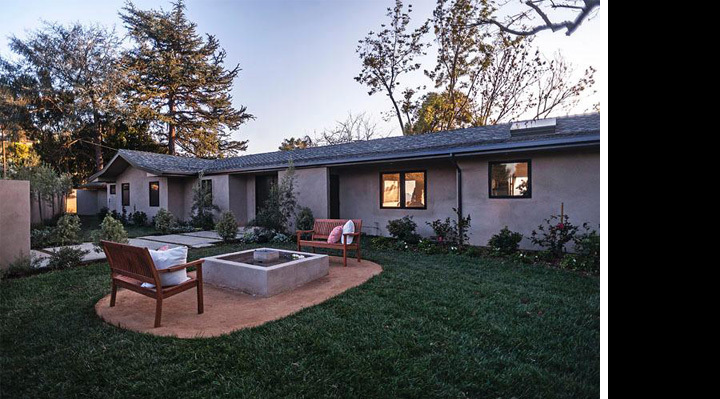 As it turns out, Mister Evans's new digs happen to be just down the street from the spacious mansion his ex-girlfriend Jessica Biel now shares with her new husband Justin Timberlake who bought the property in 2002 for $8,300,000 from actress Helen Hunt. The promontory perched compound at the end of the street has long been shrouded in mystery but—so the gossip goes—is owned by Tom Cruise. Property records—and Lucy Spillerguts—tell us that the Lexus-driving Mister Evans has owned another house above Laurel Canyon in the Hollywood Hills that's just a quarter mile as the crow flies from his new house since 2007 when he paid $1,260,000 for a two-story, 1977 mock-Med foreclosure situation with three bedrooms and 2.5 bathrooms in 2,386 square feet. As far as we know, the property is not currently on the open market. LGB as usual I agree. It makes Rianna's new lair look like a castle. I choose instead to view the shirtless photos link Mama provide us kids. Can someone please turn on the lights? Outside too please. LB, Wolfsschanze! Oh so true. Did this photographer lite that too? Big time fugly on the outside, so zero curb appeal. The interior, however, is alot nicer than the exterior would suggest. The over ask sales price (and the ask seems high to begin with, but what do I know) should encourage anyone who is about to embark on a high end renovation with the intention of flipping to study what was done here. Clearly this is what people want in this market segment in the hills above Los Angeles. You are absolutely right that curb appeal isn't very relevant if there's a wall around the house. I should have said that the exterior architecture is not appealing. I'm all about a livable interior, form following function and all of that, but for me it still needs to make me happy when I approach it on the road, or come down the driveway or when the gate opens and the house is revealed, as this case may be. There is absolutely no way around the fact that the house you choose is a reflection of you. Especially when you have 3.5m to spend. @5:14 You're one sick puppy. @ 5:14 I was on the wrong comment thread. This was not directed to you. Please forgive me. Mama Lama, Chris Evans/Minka Kelly have dated and F'd everything walking with a name, in LA. It's only fitting they fall in love. Good for you Lyla! The exterior isn't appealing or aesthetically pleasing, and the pool area is rather sad looking, but I find the interiors to be GORGEOUS. Not a bad buy at all. 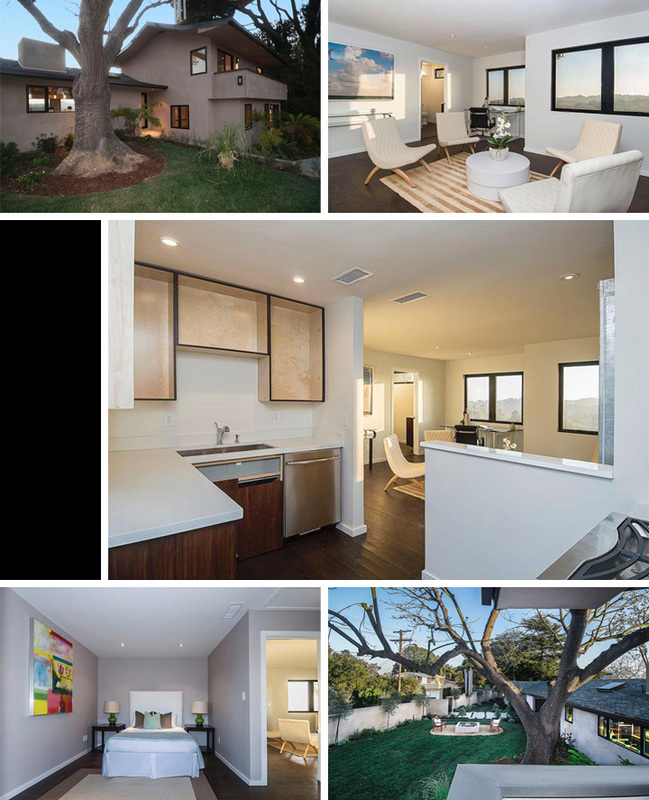 If I was a movie star and had $3.5M to spend on a home, I'd much rather a home like this than some ugly Mock-Med in Calabasas! Finally realize why I can't love this property regardless of rather nice interiors. It's those black anodized (? - whatever) windows. Reminds me of a Secretary of State office.